A list of timber species has been compiled in order to provide a composite working list of timber tree species in trade. The list was produced to answer the question “Which tree species are internationally traded for timber?” A simple enough question, although the answer was not as simple to come by. The trade in timber products contributes billions of dollars to global GDP each year. However, timber trees also provide several critical ecosystem services (including nutrient cycling, carbon sequestration, water filtration and localised climate control). Despite the escalating threats to timber species from land conversion, illegal trade and unsustainable logging, we lack up-to-date conservation status assessments for many of these species. A compounding problem is the lack of documentation regarding which tree species are actively being harvested for commercial trade. Over the years, various lists of timber species have been produced for different purposes, with different degrees of reliability and varying degree of overlap. However, the majority of such lists use common or trade names for timber taxa, making species identification a difficult process. This working list covering 1,575 species was produced by Jennifer Mark at Bournemouth University by combining seventeen contemporary open-access resources which list commercial timbers, including trade reports and publications from conservation organisations. The list is not intended to be a definitive statement regarding which tree species are traded for timber but rather, its purpose is to provide a readily accessible summary of this information, to help identify those species for which a consensus exists regarding their use for timber. It is hoped that this working list will encourage further research and assessment, to determine with greater precision the use of different tree species for timber. The information is intended to be of use to taxonomists; botanical, conservation and ecological researchers; timber-sourcing organisations; and woodworkers. To provide an integrated list of open access (or easily accessible) sources supplying information on commercial timber tree species. To provide an overview of which tree species are currently harvested and traded commercially on the international timber market. 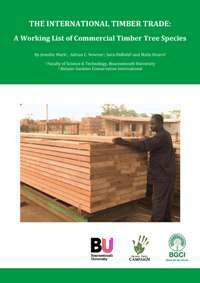 Copies of A Working List of Commercial Timber Tree Species are available to download from the BGCI and Global Trees Campaign websites. Click here to read the full report and appendix2.